It's time to face the demon - our first August hike. We recall all too well last summer, when temperatures topped the century mark for weeks on end, with humidity to match; and the springs ran dry. This is a different animal however - the coolest and wettest summer in recent memory, as we found all too well in our past two sections. Still, the June section kicked our butts, and that at high altitude, mitigating the heat considerably. It's time to head north, though our schedule precludes going too far - NY looks appealing. The sights are legendary - Graymoor Friary, Bear Mt. 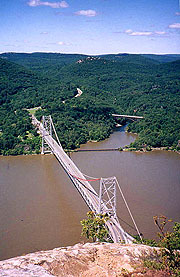 Bridge, the Lemon Squeezer; and after northern TN it'll be a welcome change to be able to hitch for town food occasionally. So, the die is cast, the Rubicon crossed - it's off for the Empire State. We begin at the home of Ralph (our shuttle), a two-time AT hiker whose house is poised a mere 400 steps from the AT. It's all as advertised, and by 2:22 we're on the AT, finding a number of stone cairns built there and our first deer almost immediately. It's a beautiful piece of trail, replete with hemlock groves, babbling brooks, and the occasional stone fence, and mirroring the day's beauty with numerous overlooks. A new underpass gets us across the busy Taconic Parkway, and on the other side is a beautiful flowing stream, with a large and tempting pool suitable for bathing. Minutes later we come on the RPH shelter, carved out of a thicket of vines on the edge of a small town. RPH (Ralph's Peak Hikers - a hiking group Ralph organized) is a wonderful shelter, with bunks, windows, a picnic area, and a desk, and supplied with some trail magic from Big John (a cooler of soft drinks with a note that he'll be back at 1830 for pizza orders). The $1 DC hits the spot, and we linger for a long break as we peruse the register. We'd love to spend the night, but if we're to reach Graymoor Friary tomorrow, we can't tarry. Soon we break out on a beautiful overlook of Canopus Lake, the beach and campgrounds (with showers and water) tantalizingly close below, though access is via the dam at the far end of the lake, with a mile's backtrack (it'd be pitch black long before we could complete this). Only later will we find that a small wash we passed would have made a quick 1/4 mile bushwack down. Instead, we wind through the hills west of the lake - darkness is falling quickly, but our goal of dinner at the Friary tomorrow means 'miles to go before we sleep'. In our typical pattern we start looking at 7:40, lowering our standards each few minutes as it becomes darker. At 8:00 we find a cozy site with a lake view - fronted by hemlocks, and with a large stone ridge on the lake side; though shoehorning the tent into the space proves challenging. Coleen sets up kitchen on the ledge, and the rising moon is veiled by the thin clouds, reflecting off the lake far below. We've plenty of water until I tip the pot over during the evening drink service, spilling over 2 cups of this precious commodity. We'll still have enough, but we have to find water early tomorrow. The next trial is the bear bag, the only suitable branch being very high, with conflicting branches all around. Finally we turn in at 10:45, though sleep comes hard, with jets flying over in the early evening, and later a wild screeching sound like a wounded fox. The moon comes out later with a warm glow, signifying the breakup of the clouds as we drift off to sleep. "Do not neglect to show hospitality to strangers: for by this some have entertained angels unawares." Waking on this foggy morn, we find the shore a lot closer than it looked last night in the dark, and ourselves well rested in spite of our precarious perch. Coleen's trying bagels as breakfast fare, and we have minimal coffee in light of last night's aqueous debacle. We're walking at 7:22, our first priority being water - the lake is laden with algae, so we wait for a clear running stream. Though tinted, it was found near the ridgeline in a rocky bed - good enough for beggars such as we. Passing the south end of the lake the fog lifts, revealing a beautiful morning with clear blue skies. After crossing the dam, the trail follows the remains of a small mining railway, built up to a huge stone causeway on whose crest we hike. The trail is dominated by short but steep climbs and descents, and as the day warms, it wears on us early. Coleen and I have differing opinions about our break point, and she responds by slowing to a crawl, even as the terrain moderates, compassing a swamp and some cornfields. Finally we reach Dennytown Rd, finding a stone building with a water tap supplying excellent water. Coleen pulls up a few minutes later with aching knees, and promptly hurls downs her pack to collapse on it as long as I'll allow. We spend about 20 minutes before continuing, with only a short walk past South Highland Rd before lunch. Chapman Rd brings a needed dose of trail magic - jugs of ice water left here (the anonymous trail angel lives a few houses down), and though we've plenty, it's far too good to pass up. 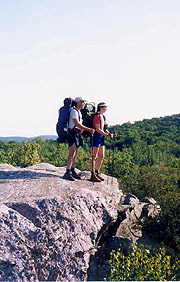 The trail passes several beautiful overlooks, and as we walk a tall thin hiker comes blazing by us. We manage a few words before he leaves us in the dust, finding him bound for the Friary also well. We make good time to its entrance, where a blue-blazed trail points us to the ball field shelter, our lodging for the night (traditionally hikers stay in the Friars' cells, though the Friary is now housing a group of Carmelite nuns whose convent has been destroyed by fire). 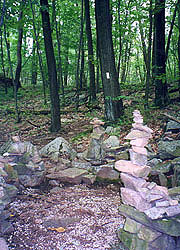 The AT has traversed the Friary's property for untold years, although the current hospitality began in 1972 as an unnamed hiker wandered in seeking food and shelter. The Friars took this as a logical extension of their mission, and it soon became permanent, a table set for hikers nightly. Currently battle lines are drawn between Graymoor and the National Park Service over NPS plans to take over the trail corridor - still, the Friars' hospitality to hikers continues unabated. The road passes a graveyard with the requisite shrine, where the beauty and tranquillity of this place begins to soak in. We direct a passing car towards the shelter, on arrival finding its occupants the parents of Fungal, slackpacking she and fellow hiker Pepper Head in from Bear Mt. They've been slowed in their thru-hike by athlete's foot (hence the name Fungal) and injuries from a recent tuna-can stove fire. The parents have tons of food (they offer some, and we're only kind enough to accept), and they end up leaving this all for the kids before heading on. We also find "Nightmare" (the hiker who passed us) waiting for the Friar to summon us to dinner. We discover he started his southbound hike last month, on track for a Thanksgiving finish. On submitting his resignation from the state of PA, he was given a leave instead, and has been receiving great support from his co-workers. His big story is of the death of Crash '90, whom he passed "resting" on an overlook near Kent CT a few days ago, found soon after to be dead. Crash seems victim to a heart attack, based on the medication found in his pack, although the Kent police still held Nightmare up for questioning. Soon Father Fred comes down to introduce himself, having worked with the hikers almost since the program's inception, and knowing most of the trail icons by name. He leaves us with a map and 45 minutes to spare, time enough for a quick cold-water shower (more birdbath than shower, but still refreshing). It's also a good time to reconsider our original schedule - Plan A was to have dinner here, then hike on another hour to Hemlock Springs, putting us in range to enable a Monday finish. My male, goal-oriented, ego-driven side likes this plan a lot, but I have serious doubts about it; and besides, I'd have to motivate Coleen, something I've not excelled at lately. "So hon, how do you feel about going on to Hemlock Springs tonight?" "Of course, we're a team." "Well then, the team is staying here for the night." "Well geez hon, I guess if you insist." Now see, this is the sort of thing 15 years of marriage teach you - I'm every bit as tired as Coleen, unsure if we'd even make Hemlock Springs by nightfall, with serious doubts about two back-to-back 16-milers following. Not only have I got my way, but Coleen supposes it's all a concession to her. This is great - an ample meal, a shower, and a marital coup to boot. Before the section is over, we'll count this moment as a turning point of our entire pilgrimage. Decision made, we head to the dining hall, joining Father Fred along with a retreat group, some friars, and the Carmelite nuns. After an inaudible public blessing the soup and garlic bread arrive, followed by spaghetti and huge meatballs with pitchers of Kool-Aid consumed in abundance. 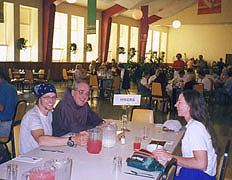 Father Fred sees to it that the bread and spaghetti are multiplied, and we chat about their ministries, including one for wayward men, a substance abuse program; and about various hikers, including poet "Nimblewill Nomad" and "Family" - a mother with 5 kids bound for Katahdin. It's a great time, and we're left with several bags of garlic bread for later, taking a leisurely stroll around the grounds before returning. Fungal and Pepper Head soon walk in, and go to work heating the Chinese takeout left for them. Another car pulls up, with a couple emerging, the girl calling herself "Oreo", her hike having been interrupted, and now seeking to play trail angel. She really wants to chat about the trail and such, but between the mosquitoes now swarming about and her incessant chatter, it's hard to say which is the more pestilential. Eventually I wrest myself away, and another hiker (her partner, perhaps) answers a few questions I have on the upcoming trail, with amazing factual clarity. The mosquitoes soon have me wearing every piece of clothing possible, and as night falls we retreat to the tent, turning in with a satisfied glow at 9:30. It's cold overnight, and we're up early, though with our new relaxed schedule, there's no urgency to break camp. Afoot at 8:15, we pass through the Graymoor property in a deep green forest with several deer foraging about. After passing a Mini-mart on Rt 9 and a couple of stiles (easier to bypass than climb), we're soon on a carriage road which is such easy walking that I'm having serious regrets about not having continued this section last night. We're racing along savoring the beauty when I suddenly realize it's far too easy, and we haven't seen a blaze for some time now. A quick stop and look at the guidebook confirms my fear - we've been off the trail for some time, and now must backtrack. We make good time back to the AT intersection (the double blaze invisible in dappled sunlight, right at a stream crossing requiring fancy footwork) having lost almost 1/2 hour. The trail turns up a fire road to Hemlock Springs campground, our intended site had we continued last night. As we break here, we find one campsite above too sloped for camping and full of trash. The lower campsite holds a tent of teenage boys recovering from the influence of Bacchus, their trashed site standing in stark opposition to the beauty and simplicity of our night at Graymoor. All told, it was a good choice to slow the pace, a fact soon to be confirmed. It's a delightful path towards the Hudson in excellent weather, and with time to spare, we take the .6 mile side trail up to Anthony's Nose for a look (competing theories exist for its name, but its nasal aspect is clear from a topo map). We slack it, stowing our packs behind a large rock, energized by our bare backs; a noon whistle below blowing exactly as we emerge onto this beautiful outcropping. Several Sunday tourists are here, one a fireman from Nyack with whom we chat for a bit. It's absolutely gorgeous up here, and the Bear Mt Bridge appears almost straight down below us, making for excellent pix (though I forgot the "Our Toes on Anthony's Nose" photo, which would have been perfect). We look down on a Beech Bonanza flying up the river, and the Hudson is full of pleasure craft seizing the day. We could stay for hours, but hunger impels us towards town. As the steep path approaches the bottom, the roar of a pack of Harleys overwhelms, as though all New England has come to share this perfect day. The bridge itself is equally stunning from ground level, the white blazes leading to a small foot path along its north side. As we cross, it's a giddying sensation to look out through the rails at the treetops far below, guaranteed to make anyone a little wobbly in the knees. The Hudson's full of boat traffic below, but the real thrill is looking down on the RR tracks as a train roars by underneath. From our height, the cars look like toys, and it's hard to believe from this that on reaching the end of bridge, our 176' elevation will be the low point of the entire AT. The tollbooth at the west end looks like a miniature chalet, and there we begin a search for entry to the zoo - the only such zoo through which the AT passes. The blazes point to a service entrance - with packs on, no one pays us any heed entering this way (no charge for thru-hikers), though once inside, we're as much an attraction as the animals, with several cameras discreetly pointed in our direction. 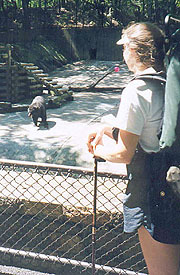 With no sign of a restaurant, we forge ahead, passing our primary goal - the black bear exhibit. We can now say we've seen our 1st bears "on the AT" (a little deceptive, sure, but it is the Clinton era), and we learn quite a bit on the various flora and fauna as we pass. At the main entrance are vending machines and a huge swimming pool, but we've no time for the latter; and wanting better food than the former, we drive on. A tunnel takes us beneath US 9W, emerging into a beautiful and crowded park surrounding Hessian Lake - we'd seen this from the Nose, but with no idea we'd pass through. Of all the wondrous sights today, this is perhaps the most incredible - we walk amidst mammoth crowds of all ethnicities enjoying this final Sunday afternoon of the summer - and still on the AT! The smell of a thousand barbecues stokes our hunger, leading us to the beautiful Bear Mt. Inn, with a cafeteria within. We meet a couple thru-hikers here - Animal and Optimist; and though Animal books early in our meal, Optimist chats with us as he consumes an entire 16" pizza. They were both cadets at the USNA who decided to punch out and hike the AT (he's educated enough to make this possible), finalizing their decision on 5/25, and leaving Springer with no prior hiking experience on 6/5. He says they've regularly been doing 25+ mile days (possible in this area), and that they're bound for Graymoor tonight, though they'll miss dinner. It's been fun , but soon we must cap off dinner with ice cream, and head on our way. The climb up Bear Mt has hundreds of side trails full of weekenders seeking directions, slowing our progress. It takes exactly an hour to the Visitor's Center, a melting pot if we've ever seen one. There are Japanese, Chinese, Indians, Hassidic Jews, and too many others to count, many in native garb. Clawing our way to the top of the observation tower, we find excellent views in all directions, including the next ridge, where we'll shelter tonight. Some Jewish boys are abuzz with questions about us and our hike, and we're all to glad to answer, but eventually we have to be on our way. As we top our water we meet Stealth and Croatalus (the latter clueless who his trail namesake is, making me think we're vacillating far too long over our own trail names). We start down the road walk, with heavy traffic coming down the mountain as closing time passes. Finally the trail turns off into the woods before ascending West Mountain, today's final climb. After a steep but short climb to the ridgeline, we're back in the welcome sub-alpine environment as the sun slowly sets in the west. The blazes are few and invisible amidst scrub oak and tall grass, but we manage to follow the trail, soon reaching the blue-blazed trail to the shelter. It's a long 20 min (.6 mile) there, and with the trail far less level than advertised, it's tempting to stop at one of the many campsites on the way, all with great views. We press on to the shelter however, and soon we see campfire smoke, with the old stone shelter appearing suddenly. The view is all we've heard and more, the Hudson Valley laid out before us, and the NYC skyline dead ahead, the Twin Towers clearly visible downtown as are the Empire State and surrounding buildings in midtown. The shelter's occupied by Joseph, his son Mario, and friend Taylor, and they have a smoky remnant of a fire going in one of the two fireplaces at either end of the shelter. It's fairly well trashed out, and the smoke within makes it bearable only for short periods, but they gladly clear a place for us as we go to work on supper (they're already done), although when Mario tells us a mouse came out of the fireplace earlier, we plan to set up our tent outside for sleeping. 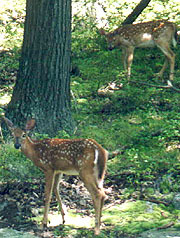 They're a good bunch, and well-equipped, though novices at camping, and as we cook, a deer forages behind the shelter, oblivious to our presence. Taylor falls all over himself trying to help us, and we move the fire to a fire pit outside. Soon we're roasting marshmallows along with our caramel corn and hot chocolate as darkness falls, revealing the lighted NY skyline ahead - almost as magnificent as the daytime view. They all follow our lead and set their tent up outside too, and we chat about the fundamentals of trail life as we sit around the fire. Bedtime approaches, although it's tough getting the boys to quiet down. As we retire to the tent, we can't help thinking that this has been our best day on the trail yet. "What's in a name? That which we call a rose - by any other name would smell as sweet." In the wee hours of the morning, we hear the stomping and snorting of deer outside; but we ignore them, and soon are back asleep. In fact, I'm out cold when Coleen finally wakes me, seeing the sun high in the sky. It's 8:24 already - how could I possibly have slept so late? We hurry through the morning routine, finding we've slept through Joe and the boys' departure as well - simply incredible. A goodbye would have been nice, but so was my sleep, and at 10:00 we're finally on the trail, a beautiful ridge walk in the sub-alpine terrain. Crossing the busy Palisades parkway we find in the forested median a chair with a box of trail magic from an anonymous trail angel, and a register. It's a good chance for a break and a coke, and as we read the register we find word of Crash's death has spread like wildfire through the trail community. It's a revelation to us as well, impressing greatly on us how tightly-knit is this band of brothers. We've procrasted far too long in assuming trail names, though we've talked of several options. Now it's clear that if we're to join the pilgrimage, it's time to discard our workday identities, taking on the mantle of the trail. From this moment forth, we are no longer Bob & Coleen, but Wildfire and Wounded Knee - Wildfire from my pyrotechnics at Rod Hollow shelter our first night, and Wounded Knee from Coleen's knee strap that sustains her on the downhills. Armed with new alter egos, we still must keep moving, the parkway crossing likened by one register entry to a game of Frogger, with us as the frogs. The trail ascends Black Mountain, another sub-alpine ridge walk, where we find a glut of blueberries growing along the path, too appetizing to resist. 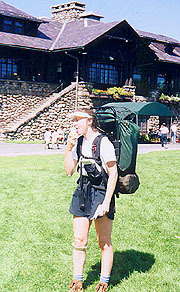 We munch as we amble along, although at this pace, we'll be lucky to finish the AT this decade. We're also treated to a flight of two Cobra helicopters flying by at eye level, compelling enough that we stop and watch them pass (with a few more berries). Suddenly around a bend appears our planned lunch break - the beautiful blue Lake Tiorati, so close we can reach out and touch it. Unfortunately, it's actually Silver Mine Lake, the first of several disappointments for the morning. 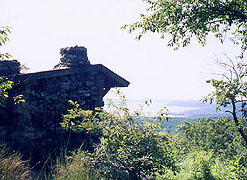 Ahead, the Ramapo-Dunderberg trail diverges from the AT on a straight course to Lake Tiorati, while the AT winds aimlessly through the woods to the north. No doubt many hikers take the shortcut, but with our purity intact, we're committed to the whole distance. Still, we're inspired by the sight of the lake, and push on, wondering when we'll see a bear enjoying the blueberries as we have (never did, though we step over garter snakes in abundance). 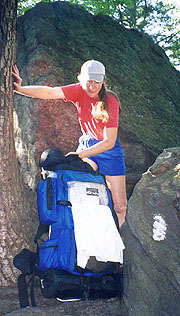 After crossing Letterrock Mt, we suddenly find ourselves in a steep descent through a difficult boulder field, and with equal suddenness, reach the William Brian shelter at the bottom. Another stone shelter, it's complete with bunks, and someone has put an expensive folding chair within, as well as a lantern and batteries, an axe, and other implements. The trail register is full of comments from hikers we've come to know over this section, and we're really beginning to enjoy this mode of communication. It's a good break, but we're motivated for lunch at the lake, so after a quick review of the route, we decide we'll be at the road to same in an hour, and push on. Soon the R-D trail diverges, where we utter a few choice curses about those who would cheat on such things. As the 1 hr point approaches, we cross the road a few minutes early, but as the trail turns northbound, it's obvious I'm in error - this is not the road to the promised land. The road we seek (the 2nd crossing of Arden Rd) is actually another 2.2 miles in the future, and adding insult to injury, the trail turns steeply up a totally unnecessary series of hills. We're well past any chances to cheat, so it's onward, cursing all the way. It's a featureless trail, save the arrival of two fawns, sufficiently unafraid to allow a pix of them both (a consolation for our efforts, Coleen points out). To heighten our disgust, the muddy areas lack any bootprints of the many thru-hikers we've passed, who obviously took the shortcut. Finally we meet the correct Arden Valley road, where it's a short .3 mile walk to the lake, finding a fair number of tourists as we steer a beeline for the vending area by the beach. We feast on sandwiches, chips, and ice cream on a stone picnic table - we're in heaven! As we do, a section hiker drives up (Gene - he's done most of the trail south, though you'd never know from his figure) - a local trail angel, and quite knowledgeable. Coleen talks him out of a ride back to the trail, even agreeing to wait while we grab a shower. First though, thinking it'd be a neat thing to take a swim, I strip to the necessary attire, heading down to the beach where I find nobody's swimming. One foot in tells me why - it's frigid, and might have been bearable immediately on arrival, but certainly not now. After a quick shower (almost immediately running out of hot water) we head to the trail, thankful to avoid this uphill walk. We thank him profusely before taking to the woods, with many miles yet to go before tonight's goal - camping atop Arden Mt. (which would require us to finish the day with a climb up "Agony Grind"). We climb Fingerboard Mt quickly in our clean and invigorated state, with the usual ups and downs. The deer are out in masse and surprisingly tame, although the mosquitoes are emerging as well. After a quick DEET stop, we head for the next anticipated challenge - the Lemon Squeezer. This narrow gap between two sheer ledges requires we remove packs to hand them down - easy enough for a duo, but far tougher for a solo hiker armed only with rope. 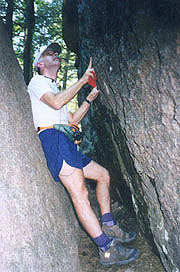 At the top we must swing around one rock outcropping hanging on to a tree as we jump to the next one - probably doable with packs on, but easier without, so off they come, and I head down first, to take the handoffs. Both my hiking pole and radio fall off their hangers in the process, although they don't go too far down the slope and are easily retrieved. Coleen adds to the buffoonery passing my pack down inverted, sending my water bottle plummeting down the slope, a substantial climb below. We look like the Keystone Cops, but we've miles to go and more squeezing to do, so it's back to work. The lower portion of the Squeezer is a long narrow channel through which the packs could be lofted overhead and carried, though it looks easier to hand them over the other side. By the time we're done the mosquitoes have found us an easy target, so we're happy to get through and resume the walk. Back on the road, our first priority is water - the only source is Island Pond before we climb Agony Grind. The pond looks idyllic before the golden sunset, but hordes of mosquitoes persuade us this is no place to stop. We filter water at its outlet, finding it a bit tinted, so we save some clear water for drinking, get going as quickly as possible. The trail climbs Green Pond Mt - easy enough, though we're not looking forward to the descent followed by the climb up Agony Grind in the failing light. The road noise from NY State Thruway increases rapidly as we approach the crest, at which point we're faced with a decision. It's 7:30, 45 minutes until serious dark, and we'll either have to climb down to the Thruway, cross, climb Agony Grind, and continue far enough to escape the noise; or backtrack a little and camp here. The camping spaces here look great, with large open spaces of long grass between the rocks, and with ample time to make our pickup tomorrow, we elect to call it a night. It only takes a few minutes to find a good and quiet spot, and with daylight left, we have the luxury of a relaxed camp setup. Firewood's plentiful, and we build a fire ring next to a large sitting log. Soon dinner's cooking, the tent's up, a nice fire going, and the bear bag and our packs both hung. It's a relaxing evening, and we turn in at 10:45 with both side vents open. We're up early, with a leisurely morning before starting another beautiful day at 8:05 - a steep but short climb down to Arden Road, which leads us across an overpass over the Thruway. Traffic below is heavy, and we stop to smile and wave in the middle before heading up Agony Grind. It's far easier than the name implies, with only a couple places requiring the use of hands, and all with good hand/footholds. Soon we're atop Arden Mt, where the trail continues through scrub oak on a fairly level pitch, though rough enough that we'd have had a tough time finding a good campsite last night. Water becomes a concern, and though the path skirts Little Dam Lake (with a beautiful sheer granite ridge on the opposing bank, a tall hemlock grove above), the lake looks stagnant, and the mosquitoes drive us quickly down the trail. We'll pass Mombasha Rd around noon, and a town meal sounds enticing - especially thinking of an icy Diet Coke there. With no sign of a hitch, we hike in - .6 mile to the deli, though we're in the outskirts of town in a few minutes. It's a quaint little upstate town on the shore of a reservoir, with beautifully flowered yards to pass. 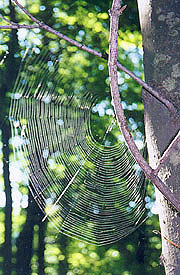 Bentley's North is our delight, busy with the noon crowd, but very hiker-friendly. We eat like kings on huge deli sandwiches, Cool Ranch Doritos and a 2 liter bottle of DC (Coleen thinks we should capture this spectacle on film), the owners bringing a hiker's register with many familiar names. As the crowd thins we chat with the proprietors, discussing Crash's death (he'd left a register message here) among other things. Thus sated, we walk back to the trail, resuming our hike at 1:40. More ups and downs take us to our next landmark, Fitzgerald Falls. The trail follows the stream down for some time, and the final climb to the bottom of the falls is steep indeed, with hands and feet pressed into service. It's a beautiful falls, though too close to the road, as there are several fire rings surrounded by trash in the area. As we pause for a couple of pix with the tripod, a small troop of inner-city looking boys passes by northbound, one of whom is a little too interested at my camera on the tripod and my radio on the ground, so we wrap it up and push on. This could be another Eden were not the numerous campsites sadly strewn with trash, no attempt having been made to even burn it in the fire pits. The trail begins uphill, as the mosquitoes start to get the better of us, we break at the hill's top, slathering ourselves in DEET, and trying some Kool-Aid to add taste to our warm water (we're spoiled from all this town food). The Kool-Aid's a bad idea, making us even thirstier, but wisely we've left Coleen's bottle untainted. Two landmarks lie ahead - Cat Rocks and Eastern Pinnacles, both rock escarpments with blue-blazed trails bypassing them for the faint of heart or marginal weather. Cat Rocks doesn't disappoint, the guidebook calling it an "upturned strata of reddish conglomerate", and though it requires a little hands and feet climbing, it's easy enough, topped with a beautiful overhang. I decide to try a shot of us both from the tripod, though it's a long run from the tripod to our perch, and practice shows I can just get it done in the timer's 10 seconds. Just before I hit the timer however, a couple of Boy Scouts come up the path, so we enlist them for their daily good turn. Next is the Pinnacles, just visible from here jutting out of the woods. It's a short climb up to another great overlook, and a little easier than Cat's Rock to traverse. From here it's an easy path, familiar from when we launched here southbound for our NJ segment, though the mosquitoes swarm us with renewed vigor, finding a surprising number of chinks in our DEET armor. We hurry down the path, soon hearing the road noise and arriving at the intersection exactly as planned at 6:15. Moments later Ralph pulls up as promised, and I find him the polar opposite to what I'd expected (partly because I'd confused the words medication and meditation) during our phone call. He's a fitness addict and an adventure junkie, espousing a New Age philosophy in spite of his high-tech, button-down employment. A child of the 60's (having probably experimented with the pharmaceuticals common to the genre), his devotion to the trail is complete, as is his hospitality. I could write volumes on this intriguing icon of the trail, but suffice it to say he was able to entertain us continuously throughout the drive home, as well as over dinner with his wife afterwards � a fitting end to this, our most fascinating section to date.